After years of pouring money and water into a lawn that was never native to this area, we decided to make a change and go with a front yard that is both native and drought resistant. Keith and his company came highly recommended from friends who had used their services in the past. We are totally, thoroughly, and completely pleased with the results. Keith's enthusiasm for and knowledge of his work came through in every aspect of the project, from the initial concept drawings to the final completion. 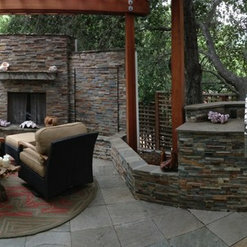 Our project included demolition, hardscaping, irrigation, lighting, and landscaping. His knowledge and professionalism are top-notch. His various crews were professional, respectful of our property, timely, friendly - a pleasure to have around for 5 weeks. The transformation of our dead flat yard to a terraced, multi-level garden is beyond amazing. The number of people who have knocked at our door to offer compliments is a real testimony to the quality and workmanship of KN Construction. There was never a day in 5 weeks when someone was not here working; no lags, no interruption, no down time. The entire project was smooth, seamless, timely. 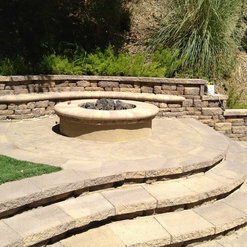 We would highly recommend KN Construction and Keith Neumann for your outdoor projects. We will most certainly use them again when we do our backyard. Keith and Adriana get an A+ in communication, pricing, time to completion, thoroughness of contract and clean-up at the end and here’s why. 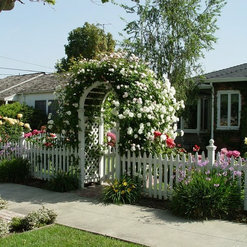 For over two decades we’ve hired many contractors to build or remodel parts of our older San Jose home. Some contractors were a nightmare and some were pretty good but we held off doing our backyard because we were dreading dealing with the ‘great unknown’ that is often associated with dealing with contractors. If we had known what a wonderful experience working with KN Construction would be, we would have done this years ago! Keith and his team built a deck, gazebo and paver patio for us and we couldn’t be happier. We LOVE our new backyard and use it almost daily. Keith’s design recommendations were spot on and he really seemed to care that it was done right. We are very confident in the work he did for us and would recommend him to our friends and family. KN Construction completely redid our whole front yard &.walkway. They were very professional during the whole project; also very knowledgeable & great work quality. I was also impressed with the owner Keith-he was always there to supervise what ever project was being done & also willing to get his has dirty. The whole project was very well done from start to finish & done on a timely manner. WOW. By far the BEST contractor we EVER hired. Keith a man of integrity and it shows on his work. We started with a complete landscape, front yard, Backyard and side yards. Then we have moved through a ton of projects in the house. I don't think there is a sq inch of our house he has not worked on. I am so happy to have found him!!!!!!! You will not find a better contractor for ANY job. I would highly recommend KN Construction (Keith Neumann) and his crew. They did a few jobs at my house. 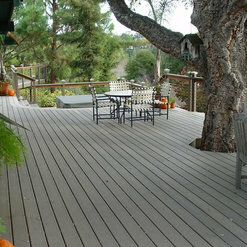 A large custom deck with spa. Rock work around the outside of the house. A couple artistic benches along the driveway. They are professional, on time, and well worth the money I spent. Keith is very good at making things unique and special. He and I spent some time designing how the deck/spa would fit into the existing space. All 3 projects turned out great! I selected KN Construction initially for hardscape construction. 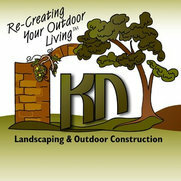 I was very pleased with the work done and re-hired KN Construction for a second landscape project. For both projects, KN Construction provided the best itemized proposals I received from anyone throughout an extensive home construction project. They took the time to break down every component of the project, include itemized costs and detail costs that made it extremely easy for me to make a decision on materials and choices. Their proposals show their professionalism and attention to detail. I received extensive on-site design support and supervision throughout both projects. A number of items on my projects needed to be thought-through and figured before construction. Keith took the time to visit the property as many times as needed, discuss the various options and make a recommendation for how to solve the different challenges we had that would meet code, engineering, design and budget constraints. All problems, big and small, were dealt with. The hardscape included new fence and retaining walls, concrete landings and patios, paver driveway and gravel side yards. The extensive landscape work included grading, irrigation system design and installation, design, plant and tree selection, new lawn, planting and outdoor lighting. Keith again took the time to review my ideas for landscape and provided a lot of input and advice to ensure the final result would work both aesthetically and functionally. His experience and design recommendations helped tremendously. Very happy too with the installation crews, also very helpful and professional and worked hard to ensure a great result. We hired KN Construction to do a complete redo of our outdoors, including front and backyard re-landscaping, front and backyard hardscaping, home painting, fence fixing, new garage door installation, outdoor natural gas firepit, and remarkable plantings. It was an enormous job for us. Keith and Adrianna were there with us every step of the way. Keith designed everything in full consult with us, suggesting ideas we never ever would have thought to. The result is astonishing. We love our entertaining in our new backyard and believe we are the envy of our neighborhood. In fact, we literally get people ringing our doorbell saying, "We love your yard. Who did your landscaping?" KN is an honest, hardworking, responsive, and extremely talented construction company. I recommend them with 100% confidence and zero reservations. Amazing landscape work. From start to finish!! I love looking at and spending time in my yard. KN Construction did an amazing job and took the stress out of the whole project. From all new design to a pool, fire pit, BBQ, and an impossible fountain project. KN made it all work seemlessly. I wouldnt have anyone else work on my landscape. We are very happy with the quality of work KN Construction has done for us. 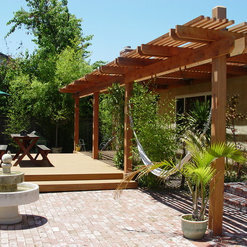 They built a deck, installed travertine pavers, and installed flagstone pathways in our back yard. Everything was done well, and the results look very nice. Keith was great to work with, and helped us with design ideas. He has a good eye for what will really look nice. Adriana was easy to get in touch with in the office, and communicated with us clearly. Their work crews worked hard and did high quality work. We will be hiring KN Construction again when we are ready to do our front yard. We had Keith, Adriana and their team come in to help us in repairing and updating our deck and front landing. Our 1980s house had a very traditional deck across 2 sides of the house on the second story where our living room, kitchen, and master bedroom are located. We wanted to fix any dry rot, add a type of high quality decking that would be better for area in terms of ease of maintenance as well as longevity. Additionally, we wanted an updated look - not the 80s ski chalet wood deck and railing we had. Keith came in and worked with us looking at a couple of different decking approaches. It was great that he was not only knowledgeable regarding composite materials but could also compare it with other traditional approaches such as treated lumber, redwood and other more exotic woods. Keith was able to help us decide on the best avenue for our objectives. We decided on Trex and have been very happy with the look and ease of maintenance. Additionally, Keith had many great creative ideas for the railing which has turned out to be a real highlight of our deck. He came up with a custom design that would help emphasize the craftsman look we wanted and at probably a lower cost that the composite railing systems. End result was that Keith constantly worked to not only meet our objectives but did it in a way that was in line with our budgets. Plus, on some of our ideas, he was able to correctly steer us away from more costly approaches. His guys worked very hard to stay on schedule especially as they found additional dry rot issues resulting from a poorly installed previous deck, making sure that the structural framework for the deck was done right. Even when we had some questions or issues, he was there right away and resolved the problems. The end result is that they created a marvelous outside living area for us of around 1200 sqft along with installing a spiral staircase to the backyard. They did the same with our front entry way which was sadly also in the 80s chalet style and not at all complementary to the rest of the house. They build a front staircase and landings (2) in the same style as the back deck. As typical of any project, we ran over our time schedule due to additional work that had to be done to resolve dry rot and not due to lack of effort or action on the job site Keith's team put in long hours and worked hard. They were very respectful and did a good job cleaning up when the job was done. Overall, Keith is great to work with. We would highly recommend his work and if needed we would definitely hire Keith again without reservation. 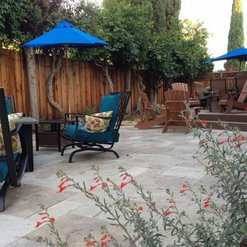 Keith and his team did a fabulous job completely reworking a challenging backyard. They created usable inviting spaces which would have otherwise been underutilized. Keith has excellent artistic judgement, horticultural understanding and and has good working knowledge of many different types of materials. He is a can do guy and could not recommend him any higher!